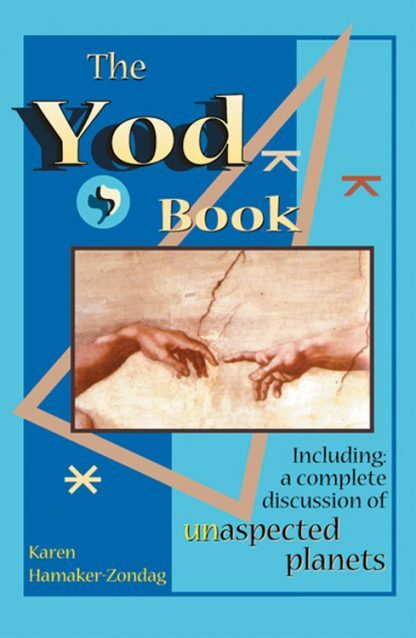 A yod is formed when two planets that are sextile also form an inconjunct to another planet. These planets are in different signs and modes and are deeply significant, for they usually symbolize patterns in families that have lasted for generations. This is what Hamaker-Zondag discovered when she started to research the inconjunct aspect as it related to a yod. Also included in this book is a complete discussion of how the energies of unaspected planets, and planets in duet (that only aspect each other) are expressed in a person's birth chart. Hamaker-Zondag says that people with a yod are often insecure, or have trouble expressing themselves, and there is an emphasis on stalemates or unusual situations. She analyzes the background and places it in a broader perspective, including how she works with elements, modes, orbs, and other astrological factors when interpreting this aspect. All in all, this is one of the most exciting books on aspect interpretation published in recent years! Included are great case histories: you have a chance to examine the Monica Lewinsky, Linda Tripp, Kenneth Starr, Bill Clinton scenario and see it with new eyes. And Princess Diana, Prince Charles, and Prince William are not without these family patterns. The stories are profound. These aspects work in the lives of people who change the world, people who have lived the unpopular position of stalemate, delay, and social change indicated by the presence of a yod in their natal chart, by transit, or by progression. She uses the examples of Gandhi, Vaclav Havel, Khomeini, Solzhenitsyn, Willy Brandt, C. G. Jung, Jim Jones, and others. To help you work with your own clients, Hamaker-Zondag brings in the charts of her personal clients and explains them in depth. When you've read this book, you'll want to check out the charts of everyone you know!